And that’s a fact. I will never go to the Midsomer villages, because, a, they are fictional and b, way too many people are murdered there. Well, I am talking about a television show. One I have recently immersed myself in, a British murder-mystery detective show. I am on season 6 now, with many seasons left to watch (it seems to go on and on forever). 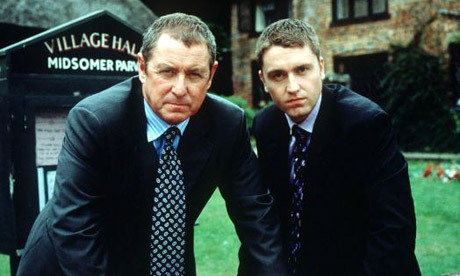 Midsomer Murders is one of those shows were the detective is experienced and brilliant and, in the end, he always gets his man. I love that. Yes, it’s too easy and yes it isn’t realistic, but it makes for damn good television and that’s all I’m asking for really. I mean, there are quite a few repeat ideas, and there is nothing realistic about the same group of villages experiencing homicides to this extent over and over, but I can live with all of that, for entertainment’s sake. In my mind, the only real problem with this show lies just there, in my mind. I have already used the word realistic several times in this post. One might think that my knowing and acknowledging the show’s lack of realism would stay my imagination. However, my logic and my imaginings don’t always agree. So that, at night, a closet is no longer just a closet, it is now the perfect hiding place for a criminal mastermind. Everything becomes slightly sinister, a bump, the wind, an open door. And, do you know something? It’s all quite exciting! And, until I start losing sleep over it, I will continue to soak up the murders, look intently for clues to the mysteries, rejoice in the right person being driven off to prison and look in every closet before going to bed. I’ll have to check this one out. Did you watch the Sherlock mini-series yet? It’s so amazing. And it got picked up for a full season. I haven’t yet, but I have it all set to watch next 🙂 can’t wait!